Situated amidst the sparkling waters of Tampa Bay, Florida and among the scenery of the 1,300-acre Wolf Branch Creek Nature Preserve, MiraBay welcomes residents of all ages. The unique combination of low-maintenance homes, desirable amenities and a socially active lifestyle make this community appealing to most homebuyers. Here, a variety of Tampa's most reputable builders offer single-family homes that all harmonize to create a neighborhood with pleasing coastal architecture. Upon completion, the community is expected to encompass approximately 1,700 homes. Located on 750 lushly landscaped acres 20 miles south of Tampa, this community offers a high standard of living with resort-style amenities. With its proximity to the sea, MiraBay has boating access to the Gulf. Residents can literally go fishing, sailing or swimming from their backyards. The resort-style MiraBay Club functions as the heart of this neighborhood and offers something for everyone in the family. Its pool is open year round and includes dedicated lap swimming lanes, a water slide, beach entry and designated toddler pool. MiraBay Club also houses The Galley Cafe, which offers burgers, sandwiches and salads for poolside enjoyment as well as Happy Hour at sunset. Healthy and active living continues at the fully equipped fitness center with weight-training equipment and cardio equipment like Vision treadmills, upright and recumbent bikes, stair climbers, and Matrix ellipticals. Personal training and group fitness classes are available to all residents. Classes include studio cycling, yoga and Pilates. In addition, the gym offers nutritional counseling for optimization of a healthy lifestyle. Outdoor enthusiasts have plenty of opportunities to enjoy fitness and fun on five lighted tennis courts, sand volleyball and basketball courts. Nature lovers can take bike rides along the preserve, relax by the lagoon and fish from the pier. Water enthusiasts can cruise the Mangroves by grabbing a sunfish sailboat or kayak from The Outfitters Bait and Tackle Shop, which provides MiraBay residents with outstanding customer service. When it's time to relax, the MiraBay Spa pampers residents with massages, pedicures and facials. 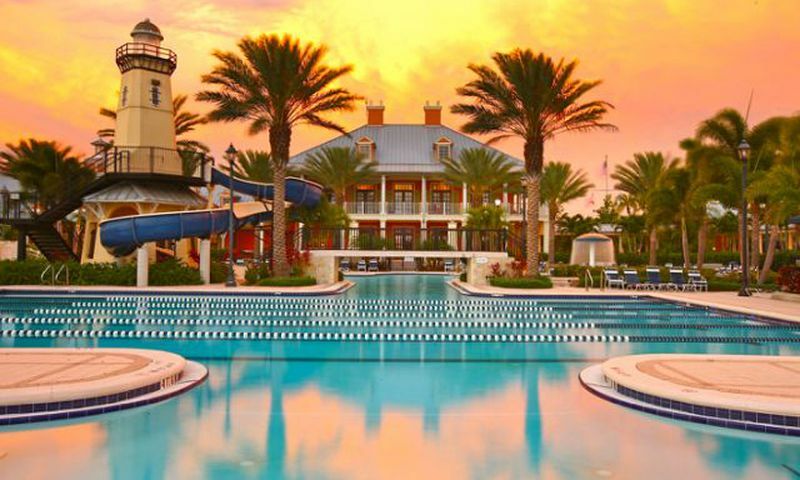 MiraBay was started in 2003 and offers a variety of home styles by David Weekley Homes, Cardel Homes, Sabal Homes, Ashton Woods Homes and Homes by WestBay. The residence styles include custom estates, low-maintenance villas, traditional single-family homes and cottages. Ashton Woods Homes' floor plans have between three to five bedrooms, two to four bathrooms, two to three-car garages and range in size from 1,924 to 3,040 square feet. Homes by WestBay offers between 1,586 to 2,904 square feet of living space. For homebuyers who want a more custom option, David Weekley Homes and Sabal Homes offer buyers the opportunity to build fully custom homes. Many of these homesites offer water views or boat slips with ocean access. Living in this resort-style community is like a daily vacation. In addition to tennis, swimming, spa and fitness services, the MiraBay Club has a full schedule of planned events and organized activities for all interests. The club staff posts all events on a website and also publishes an activity calendar in the MiraBay News. Residents can also join special interest groups. These include dinner club, ballroom dancing, financial review club, running, mariners club, bike road riders, book club, soccer and the Dragon Boat club. Located in Apollo Beach along the Gulf Coast, MiraBay is in close proximity to Sarasota and Tampa Bay restaurants, theaters, museums, art venues and plenty of shops. Orlando's world-class attractions and the sandy beaches on the coastal islands of Sanibel, Anna Maria, Captiva and Longboat Key are popular day trip destinations in the vicinity. Apollo Beach, as a small resort town, lends itself to wildlife watching, especially at the Manatee Viewing Center and the Apollo Beach Nature Park. MiraBay Club - 10,000 Sq. Ft. There are plenty of activities available in MiraBay. Here is a sample of some of the clubs, activities and classes offered here. WestBay Homes offers floor plans ranging in size from 1,586 to 2,904 square feet of living space. Each floor plan offers at least two bedrooms, two bathrooms, and an attached two-car garage. These open floor plans provide first floor master bedrooms and open floor plans. Cardel Homes offers eight floor plans ranging in size from 1,800 to 3,484 square feet of living space. These models offer at least three bedrooms, two-bathrooms, and an attached two-car garage. These homes provide low-maintenance exteriors perfect for any homebuyer. Ryland Homes offers beautiful single-family homes that range from 1,804 to 3,514 square feet of living space. They have three to five bedrooms, two to four bathrooms, and an attached two-car garage. Ashton Woods offers ten beautifully designed floor plans. These models range from three bedrooms with three bathrooms and an attached two-car garage to four bedrooms, four-and-a-half bathrooms, with a three-car garage. Many homes offer flex rooms that can be a den or another bedroom. Sabal Homes offers luxurious custom built homes. Please Note: Floor plans are not available at this time. David Weekley Homes offers great custom homes with low-maintenance features. Please Note: Floor plans are not available at this time. I fell in love with Mirabay when I was looking for a second home and took my little sister trick-or-treating there. Everyone was so nice and there was a strong sense of community. Now that I have a home there the only issue is my extended family can't use the house and amenities unless I'm in town. If you are looking to live there full time that would not be an issue. I love Mirabay!!! The people are great and the community is beautiful. The amenities are better than any hotel or community I have ever been to. The community pool has a big water slide that my kids love to go down a 100 times!!! The pool is big enough to have your own private area. The club house offers a variety drinks and food. The community is always doing this together for example we just had a Fall Festival with food trucks and activities for the kids. Let's not forget its water front community so you can always just jump on your boat and go to Tampa in 20 min or St Pete. In my opinion this is an up and coming community. I love it here!!!! I cannot say enough about the great things this community has to offer. We started out as renters 2 years ago and loved it so much we decided to buy in Mirabay and closed on our home in January 2017. I love Mirabay!!! The people are great and the community is beautiful. The amenities are better than any hotel or community I have ever been to. The community pool has a big water slide that my kids love to go down a 100 times!!! The pool is big enough to have your own private area. The club house offers a variety drinks and food. The community is always doing this together for example we just had a Fall Festival with food trucks and activities for the kids. Let’s not forget its water front community so you can always just jump on your boat and go to Tampa in 20 min or St Pete. In my opinion this is an up and coming community. I love it here!!!! Just a note to comment on the review left on June 24, 2013 by Alan R.
This community is in Apollo Beach, FL, and sits adjacent to Tampa Bay, not the Gulf of Mexico. 55places.com is not affiliated with the developer(s) or homeowners association of MiraBay. The information you submit is distributed to a 55places.com Partner Agent, who is a licensed real estate agent. The information regarding MiraBay has not been verified or approved by the developer or homeowners association. Please verify all information prior to purchasing. 55places.com is not responsible for any errors regarding the information displayed on this website.